For those of you who enjoy engaging your children’s imaginations with the Easter Bunny, you already know that your children or grandchildren look forward to the Easter Bunny every single year. Make it a tradition to leave evidence that the Easter Bunny has indeed been hopping around, and create a simple path to the goodies. You will love to watch as your little ones’ eyes light up, open wide and can barely contain themselves when they see he’s already been there. Bunny Droppings: Leave a trail of bunny droppings with either chocolate covered raisins or black jelly beans (you know your kids won’t eat those black ones anyhow). 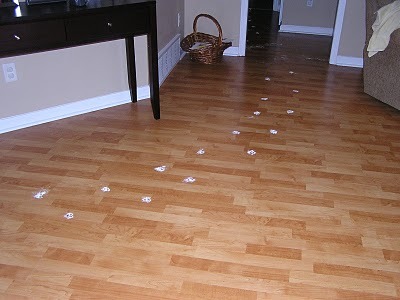 Bunny Tracks: There are a few ways you could do this using baby powder. Either cut out a small paw print template to help you make a realistic print before sprinkling the powder or lightly coat your thumb, index finger and middle finger in flour. Keep your two fingers together about an inch above the thumb and then start pressing your fingers on the carpet or furniture to make a trail. This sweet trail can be as long a trail as fits your child’s age, and can wind inside and out of your home. 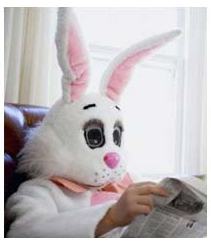 They will squeal with delight as they follow along the Easter Bunny’s path. Bunny Fur: Use bunny fur to help guide them on their Easter egg hunt. Take a few cotton balls, shred them up and sprinkle on the floor. If there isn’t fur going into a room, there are no eggs to be found there. For many more Easter traditions, Easter decorating ideas, and Easter recipes, check out my Easter Category.